Hundreds of people gathered outside the White House on Wednesday to protest President Trump’s decision to rescind guidance on how public schools should accommodate transgender students. Gavin Grimm, a trans student who filed a lawsuit against his Virginia school district’s bathroom policy that the U.S. Supreme Court will hear next month, is among those who spoke to the crowd. Grimm spoke to the crowd less than an hour before Trump formally rescinded the Obama administration’s guidance to public schools that said Title IX of the U.S. Education Amendments of 1972 requires them to allow trans students to use bathrooms consistent with their gender identity. Grimm noted the Title IX guidance protected “hundreds of thousands of transgender students across the nation.” He became emotional at the end of his remarks. U.S. Rep. Ileana Ros-Lehtinen (R-Fla.), who has a trans son, is among those who echoed Grimm’s criticism. 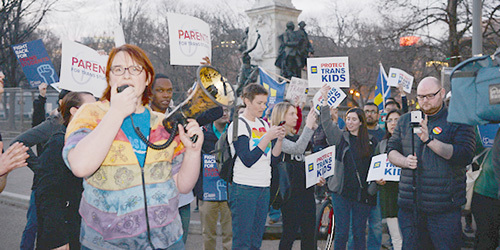 “This lamentable decision can lead to hostile treatment of transgender students and studies have shown that bullying and harassment can be detrimental to the emotional and physical well-being of teenagers,” said Ros-Lehtinen in a statement she released earlier on Wednesday, noting she and gay Colorado Congressman Jared Polis introduced the Student Non-Discrimination Act that would prohibit schools from discriminating based on sexual orientation or gender identity. National Black Justice Coalition Director of External Affairs Isaiah R. Wilson described Trump’s decision to rescind the Title IX guidance as “shameful and contrary to American values.” Those who spoke outside the White House on Wednesday echoed this sentiment. “They’re being bullies,” said National Center for Transgender Equality Executive Director Mara Keisling, noting trans students routinely face bullying. Catherine Lhamon, chair of the U.S. Commission on Civil Rights, helped write the Title IX guidance the Departments of Justice and Education issued in May 2016. She told those who gathered outside the White House that “today is a really hard day” because “we lost a federal champion for nondiscrimination with the declared withdrawal of that guidance.” Lhamon further stressed Title IX itself remains in place. “They withdrew the guidance today, but they haven’t changed the law,” she said. Human Rights Campaign President Chad Griffin criticized Trump directly. Raffi Freedman-Gurspan, a trans woman who Obama appointed as his LGBT liaison in March 2016, also spoke outside the White House. GLSEN Executive Director Eliza Byard, Pride at Work Executive Director Jerame Davis and Equality California National Policy Director Valerie Ploumpis were among those who attended the protest.